During my stay in the archipelago I finished both wip sockpairs. The Snickets were almost done before we came there, but the Latvian socks needed more knitting. Fortunately I got inspired by my pictures of the first sock, and finished the second in a quite speedy way. First up are the Snicket socks. 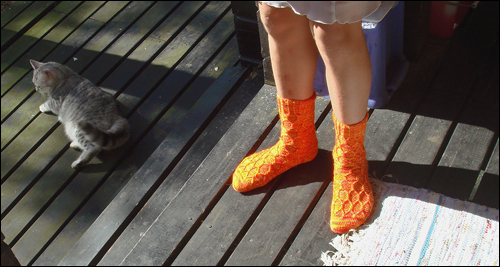 The socks are knitted on 2,5 mm dpns, with VillaMokka's yarn Mokkasukka (75 % wool, 25 % nylon) in the colourway Viimeinen kejsari (Finnish for The last Emperor). The yarn is a hand painted one, and beautiful. You can look at more of Villamokka's yarns at her blog. The Snicket socks pattern is a nice one, well written, and as I mentioned the short row heel I so far like the best of all I've tried. It was first published in MagKnits, but is now available as a free download in Ravelry. In the smallest size they are perfect for my younger daughter, with a shoe size 37. The Snicket pictures are from the east terrace of the house on the island, but it started to rain before I finished the Latvian socks, and we pictured them here at home. 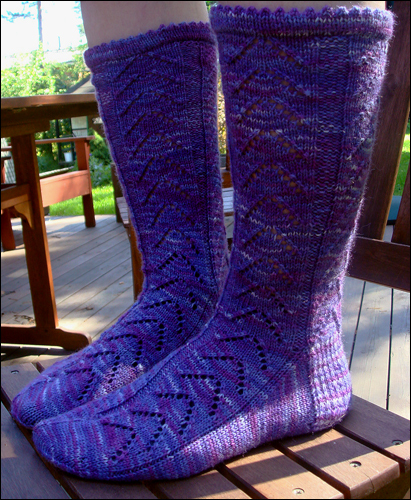 The pattern for the Latvian socks is to be found in Nancy Bush's book Folk socks. I have again used Mokkasukka yarn, this time in the colourway Iris. 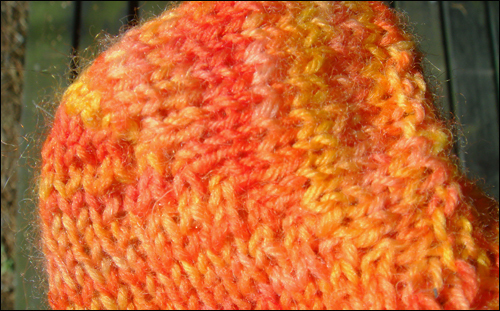 The picot cuff is knitted on 2,5 mm dp needles, the rest on 2 mm needles. I used almost all of the 100 gram hank of yarn, and I must admit I had a slightly scary feeling when knitting the toe of the socks. It looked like so little left. The socks were intended for my mother, and she will get them as a thank you for taking care of Ludde while we were on the archipelago holidays. But they suits me very well too, and I have 38 in shoe size. A very nice pattern this too, as Nancy's usually are, they fit my foot very well. an album, so you can have a look at more than a couple, click here! 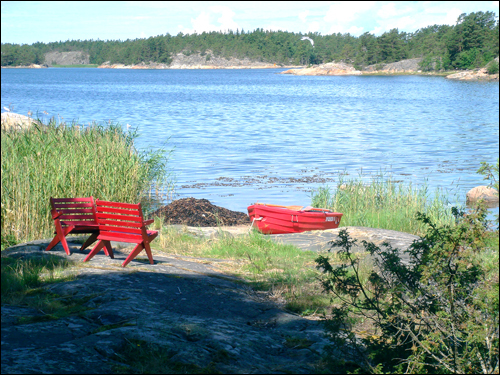 These pictures are all taken in the archipelago of Turku, in southwest Finland. 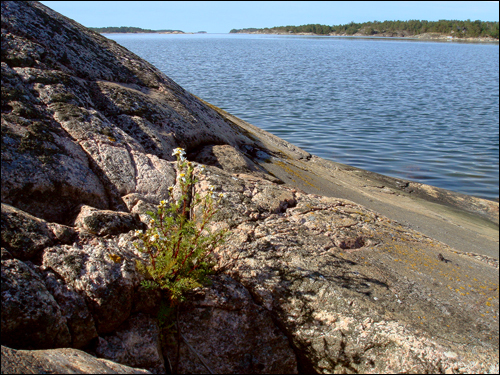 It's a beautiful place, and you can see my love for stones and rock formations, I can't stop taking pictures of them. The house on the island is very primitive, with some solar energy, but no running water, and with a nice vegetable plot. It's easy to forget about the troubles at home when over there!